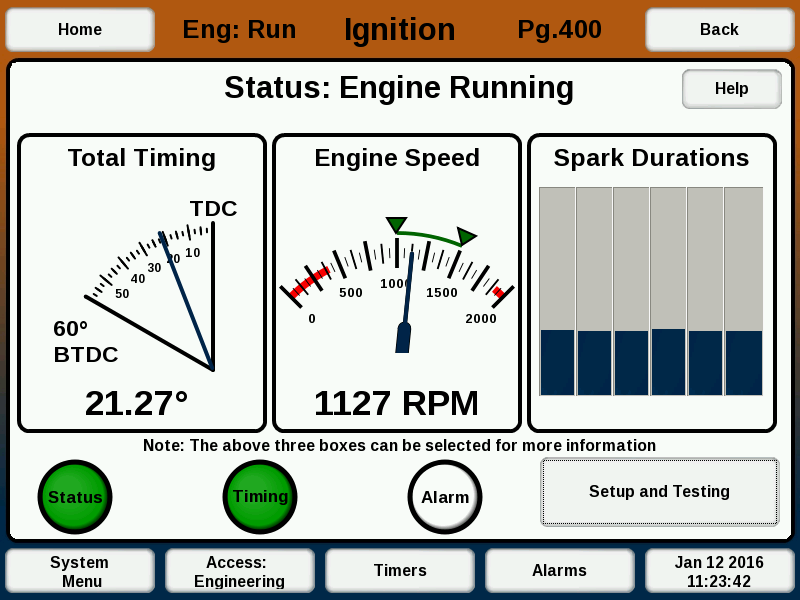 Ignition Home Screen – Welcome to the EMIT Technical Forum! The Ignition Home screen (Pg. 400) provides all the necessary information and functionality to quickly observe the system state and access additional diagnostic and setup features. The very top of the screen provides the overall status of the ignition system. The timing box below displays the active timing, and the timing display can be clicked to make adjustments. The center box shows RPM. The lights at the bottom of the screen show the system and timing status, and can be clicked to see diagnostic information. The right box shows spark durations. A security mode of Setup or Engineering is required to access any of the setup and testing features. At the bottom of the Ignition Home screen are three status lights- “System”, “Timing”, and “Alarm”. These lamps give a quick snapshot of system status. Clicking on this area will go to the Engine Running Diagnostics and Testing screen (Pg. 420 or 422), to see runtime diagnostics. Displays green if the Ignition is connected and powered on, and configuration is complete. The right side of the Ignition Home screen shows the current spark durations. If not relatively steady and similar values, this could indicate a problem with a plug or coil. Selecting this graph will go to the Cylinder Information screen.